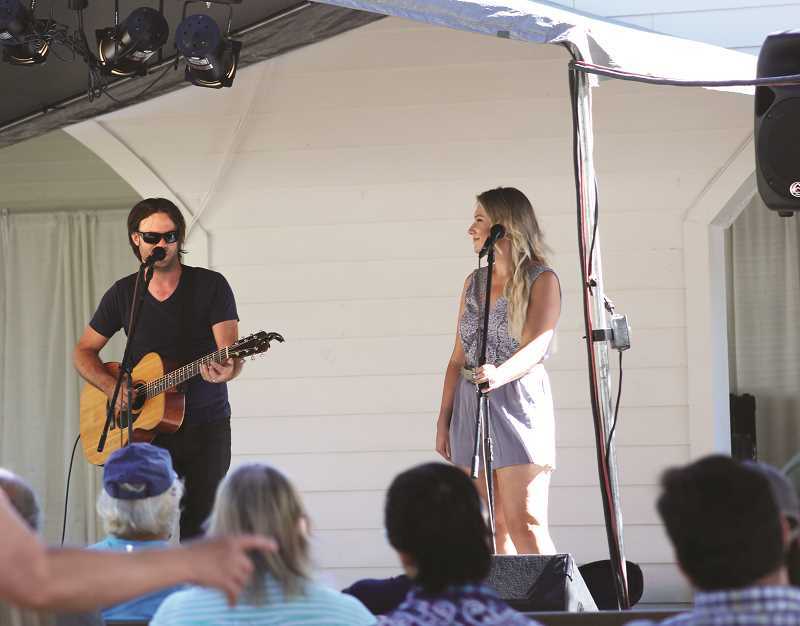 Meet the husband and wife duo Pierce Avenue, who ended their 30-day Oregon tour on Clackamas County Fair's main stage. A singer and a guitar player meet in a Texas dancehall, and the next thing you know, they're slaying harmonies on stages all over the country including the Main Lawn Stage at the Clackamas County Fair. Of course there is much to see, hear and pet at the fair; and among them are the musical acts that grace the three stages. On Thursday evening, the Nashville-based husband and wife duo Pierce Avenue drew a crowd when they took the main stage. The country-tinged musical act consists of Jaime and Tony Pierce, who alternate singing the melody and the harmony, all while Tony strums his acoustic guitar. The two met at Cowboys Dancehall in Arlington, Texas where they were both members of the house band. "We weren't looking for each other, but I'm glad it happened," Tony said. Prior to meeting, Jaime and Tony had each pursued their own music careers. "I started performing in front of people when I was 11, in Indiana, where I'm from," Jaime said. "I would play around town, like at my county fair and anywhere people would hire me. I was a kid making $100 an hour singing to karaoke tracks around town." Tony started playing guitar when he was just a kid. Then as an adult, he began touring as a guitarist for different bands. After meeting Jaime, he landed a gig with Broken Bow Records artist Dustin Lynch, and the couple moved to Nashville. "The day after we were married, we were on radio tour for the first week promoting 'Cowboys and Angels,'" Jaime said. Tony said he enjoyed playing guitar for Lynch, but he soon got an itch both to pursue his idiosyncratic musical style and to be with his wife. "With most of the bands I had been on the road with, you're gone all the time," Tony said. "Literally, two-thirds of the year, you're not home, which wasn't a big deal when I was 20. But then when I met my wife, we got married, and it just kind of was not the dream I thought it would be. I had more to live for at home than I did just playing guitar somewhere." That's when Tony and Jaime began writing songs together and singing them around Nashville. "It just kind of fell into: 'We should just do this. This is what we should do, because that way, we can travel and see things and be together through it all,'" Tony said. And so, Pierce Avenue was born, and many of their original songs spring from their relationship. The independent artists are content to be doing life and music together, and they don't want to be too hasty to jump into a record deal. "If we were to take it further, we would want it to be the right situation for us—not just for the sake of having a deal," Jaime said. "Some people get so caught up in wanting to be up here that they don't think of what it might cost them on the way. At the end of the day, we're married and best friends, and we would never want to do anything to jeopardize that. Our relationship is always going to come first." The duo has been touring in Oregon for 30 days, their stint on the fair stage being their last day in the state. They've enjoyed the scenery and of course the microbreweries (Widmer Hefeweizen is currently Tony's favorite). "We've fallen in love with your state; it's a beautiful place," Tony said. "I wish we could stay, but we've got to get back and mow our grass." For quick access to their YouTube channel, iTunes music and social media, visit pierceavenue.com. In the upcoming year, fans can expect to hear some new music from the duo.